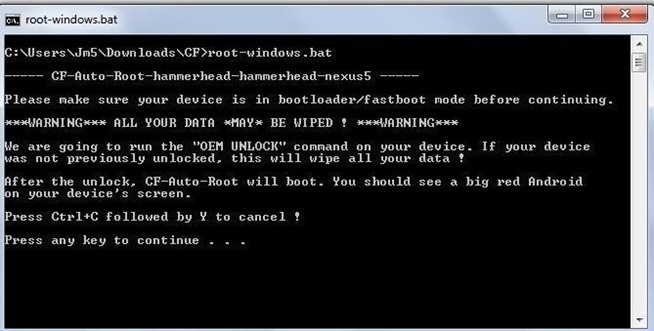 In this tutorial we will be using Chainfires CF-Autoroot to root your Galaxy Note Pro 12.2 LTE P905. On your Note go to Settings ->About, tap the Build number repeatedly untill you get the message “You are now a Developer”. Then head over to Settings->Developer options, then check the box marked USB debugging, which will allow your Windows PC to send commands to your device. We’re going to use Android developer Chainfire’s rooting tool CF-Auto-Root, it will automate the rooting process for us. Power down your Note Pro 12.2 P905, then boot into bootloader/fastboot mode by holding in the Volume Down, Power key and the Home button at the same time. You should see a black screen with a picture of the Android mascot on his back, you can navigate through the menu using the volume buttons. CF-Autoroot will guide you through the rooting process. It will first attempt to unlock your bootloader. Cf-Autoroot will now start to work, just wait for it to finish….